When we think of family coming together for a delicious turkey meal we think of Thanksgiving. What a wonderful holiday for warm family greetings and of course the beautiful table setting. 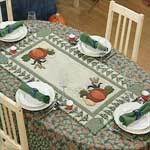 Create a unique table setting and home decor this holiday using your sewing talents. Watch your dining room transform with an autumn leaf wall hanging, a table runner in rich fall colors or a cute turkey centerpiece. Make this Thanksgiving one the whole family will remember just by following one or more of the craft patterns listed below. 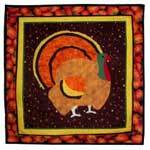 Using this turkey applique you can easily create a festive wall hanging just in time for the holiday. This is an easy-to-follow pattern for making dining chair covers in colors and prints to match any holiday or occasion. 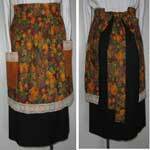 Create an eye catching apron that is perfect for Thanksgiving just by using fall colored prints. 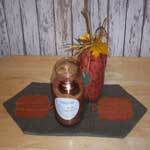 This lovely table runner will certainly add to your Thanksgiving table with a harvest of fall veggies on each end. 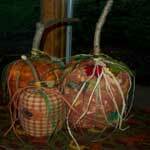 You can add so much to your Thanksgiving decor by making pumpkins out of fabric and a few tree sticks. 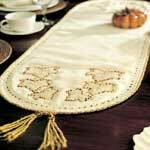 Create a stunning table setting by adding this lovely table runner with embroidered leaves and tassels on each end. 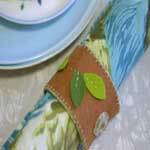 Here are instructions for making holiday napkin rings that will set your table apart from the rest. 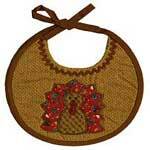 Keep your baby dressed in Thanksgiving style by sewing a baby bib with turkey applique. Thanksgiving pattern for making a table runner with a pumpkin on each end. 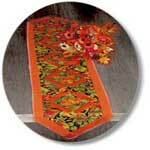 This table runner can be placed on a entry table or any flat surface. 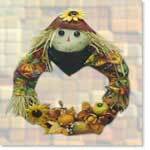 Let this lovely wreath greet your holiday guests with colors of autumn and a sweet smiling scarecrow at the top. 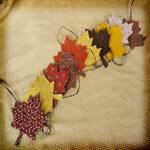 Bring the beautiful colors of fall indoors by making a garland that consists of an assortment of fall leaves. Hangover windows and doorways. 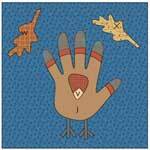 Here are detailed instructions for making placemats with a Thanksgiving fabric print. 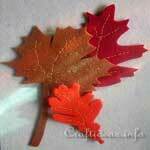 Decorate your home with rich colored autumn leaves. 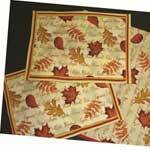 The leaves can be used alone or sewn on pillows, aprons and other items. 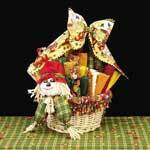 Using fall colored fabric with festive print and a plain basket you can make a cute little basket to add to your Thanksgiving decor. 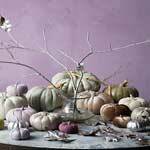 Create large and small fabric pumpkins that can be used as part of your dining table centerpiece. 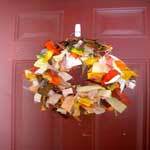 Gather up your fabric scraps in fall colors and make a great looking wreath using this Thanksgiving wreath pattern. 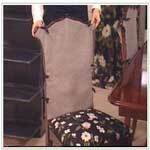 This isn't an ordinary pillow and can be used in many ways. 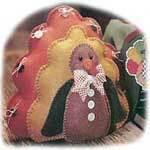 This is a sewing pattern for a cute little gobbler that sits on the table with notes of thanks. A table runner is an easy project and adds so much to your holiday decor. 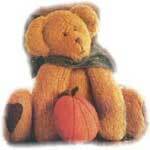 Sew this cute little autumn colored teddy bear holding a pumpkin. This is an adorable pillow with a turkey and falling autumn leaves. 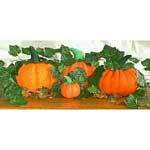 This is a long and narrow wall hanging that will create a Thanksgiving spirit in any room. 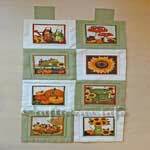 This table runner is a great accent to any table and sew easy to make.